I've been talking about it for months - Disney on Ice coming to the Patriot Center at George Mason University in Fairfax, VA (Northern Virginia/DC Metro area). I may be a boy to two boys, but we all love Frozen and knowing this was coming to town, I jumped on the chance to take my family. The four of us headed out for an early dinner and made our way to the Patriot Center with plenty of time. I highly recommend aiming to arrive at least 60 minutes prior to showtime to allow time for parking - it took us about 30 minutes! When we finally got inside, we were overwhelmed with Princesses - so many little girls and even a few kids at heart - were dressed as Anna, Elsa, and even Olaf! 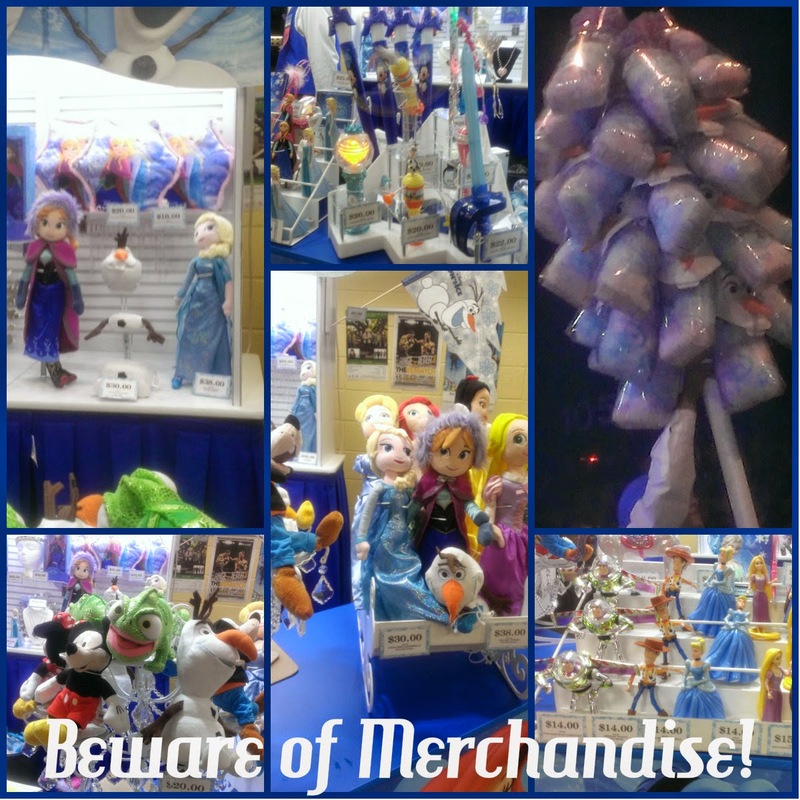 The food stands were selling all types of food and the merchandise tables were overflowing with lighted displays of toys, dolls, and too many other trinkets that had my boys watching for a good long while! I will admit - we've definitely come home from these events with a lot of.... stuff... but this time, we held strong and said no! If you are planning, the prices ranged from $14-$40. The show started by having some of the cast come out to pump up the crowd - shortly into the warm up, they introduced the 'hosts' of tonight's show - Mickey and Minnie Mouse!! After skating around, and talking, for a few minutes, they brought out some friends: Goofy, Donald, Ariel and Prince Eric, Snow White and Prince Charming, Buzz and Woody, even Timon and Pumba! After the wonderful introduction, the show began - just as you would expect... Sven, Kristoff, and ice. Then, young Elsa and Anna played, sang, built a snowman, and skated. The lighting was not conducive to my camera skills, so it was difficult to get all the best shots, but I wanted to share some! The story is just about exactly what you would expect - a few minor changes to fit the stage and a shorter time, but it was fantastic! Disney on Ice: Frozen is visually stunning - the choreography is even stronger than in the previous Disney on Ice show that I attended last fall. The story line is stronger, yes, but it's the colors, sets, lights - the show is so incredibly vibrant! My husband, being the boy, said that Marvel Universe Live! 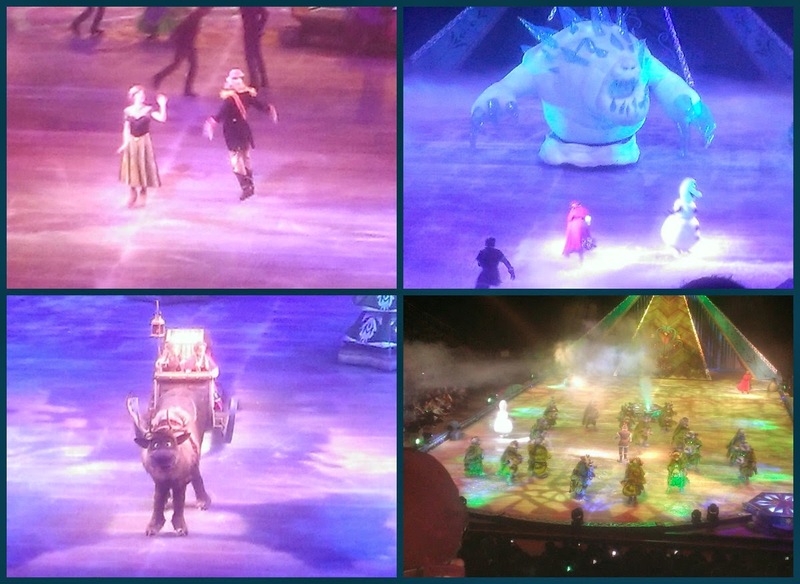 had more fun pyrotechnics and was more exciting, but I enjoyed the bits of flash, snow, and beauty that Disney on Ice: Frozen offered! It's probably completely sold out, even with the extra shows - but if you get the chance, definitely go! This show was so much fun - I wish my boys had more energy to really enjoy it as much as I did! I am a Feld Family Ambassador, and in exchange for my time and efforts in attending shows and reporting my opinion within this blog, as well as keeping you advised of the latest discount offers, Feld Entertainment has provided me with complimentary tickets to Feld shows and opportunities to attend private Feld pre-Show events.Even though I receive these benefits, I always give an opinion that is 100% mine. Welcome to those of you joining me from Rolling with the Magic and those of you just hopping aboard. I am the 3rd stop on our Magical Blogorail. When the topic of Disney Legends first came up for this month's Magical Blogorail Blue, I immediately jumped to one that has always stuck with me - Francis Xavier Atencio. X Atencio, as he is most well known, started working at Disney as an animator, where he worked on one of my favorites, Fantasia! In 1965, Walt asked X to work for Imagineering, then known as WED Enterprises, to assist on some Disneyland projects, specifically, the Primeval World diorama. Walt tapped into X's "untapped hidden talents" by asking him to write music - X Atencio, the man who started his career as an animator, wrote Yo-Ho, the song from Pirates of the Caribbean! I love how Disney honors the Disney Legends, with little mementos throughout the parks. Take those infamous epitaphs over at the Haunted Mansion - those are based on the Imagineers that helped create the attraction! X Atencio not only helped with the theming of the Haunted Mansion, but he can even be heard in two separate places - once coming out of the grave "get me out of here" and at the end of the attraction, leading you where to go! Also, his musical skills can also be heard in the attraction, as he co-wrote Grim Grinning Ghosts, the song heard throughout the attraction! 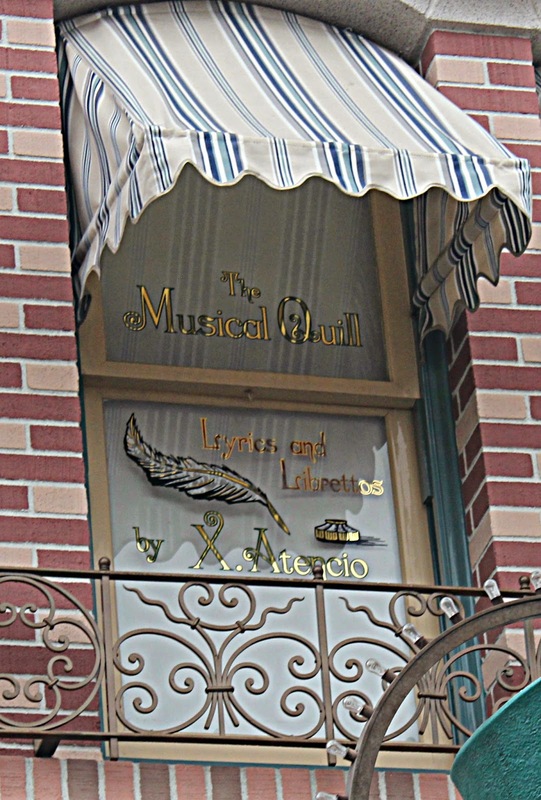 Many of the Imagineers have specially dedicated Windows along Main Street, U.S.A. Francis Xavier Atencio has a Window of Main Street, U.S.A. in Disneyland! For more uncovered tombstone, windows, and trivia, check out my section on trivia! And for more Disney Legends, continue on with this month's Magical Blogorail Blue! Thank you for joining me today. Your next stop on the Magical Blogorail Loop is My Pixie Dust Diary. 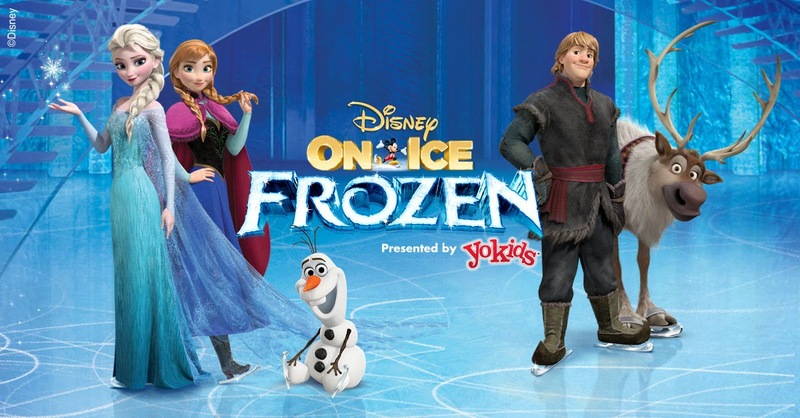 Disney on Ice - Extra Show Added! 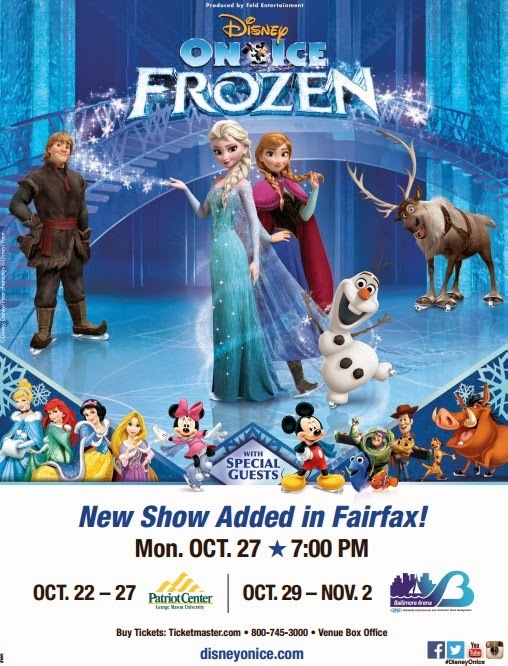 [FAIRFAX, VA., October 15, 2014] – Feld Entertainment, Inc., the worldwide leader in family entertainment, announces that its 34th Disney On Ice spectacular will bring to life the Academy Award®-winning and number one animated feature film of all time, Disney’s Frozen, in Fairfax October 22 – 27 at Patriot Center. Tickets are on sale now for all 13 shows, including a show on Monday, October 27 at 3:00 p.m.– an addition to the previously announced Fairfax schedule. For more information on the Frozen tour, please log on to www.feldentertainment.com, or connect with the Frozen updates on social media via Facebook (www.facebook.com/DisneyOnIce), Twitter (@DisneyOnIce/@NicoleFeld (show’s producer Twitter feed) and YouTube (www.youtube.com/DisneyOnIce). · Wednesday, October 22nd @ 7:00 p.m.
· Thursday, October 23rd @ 7:00 p.m.
· Friday, October 24th @ 10:30 a.m. 3:30 p.m. and 7:30 p.m.
· Saturday, October 25th @ 10:30 a.m. 2:30 p.m. and 6:30 p.m.
· Sunday, October 26th @ 10:30 a.m. 2:30 p.m. and 6:30 p.m.
· Monday, October 27th @ 3:00 p.m. and 7:00 p.m.
Coming to the Patriot Center at George Mason University in Fairfax, VA later this month! I have my tickets and I know that the show has been so popular that they've added multiple shows from the original plans! We saw a commercial for it on television the other day and both of my boys went gaga and begged to go see it. What they don't know is that we have 4 tickets ready to go! Bedtimes will not be followed that night, but I think we'll survive! We are so excited to see this show - are you?